For the first time in forever…we have news regarding “Frozen 2!” In case you missed it, Disney announced the film’s release date on Twitter this Tuesday. Yep, you read it right – we still have over two years of waiting before the sequel hits theaters! While that seems like a ridiculously long time to wait, we know that the end product will be totally worth it. Those of your who follow me on Instagram received a subtle preview to the piece that I am featuring today. Although we’ve seen a few 70 degree days over the past couple of weeks, Upstate New York is witnessing a resurgence of winter, with this weekend being particularly frigid, heralding sub-zero temperatures. 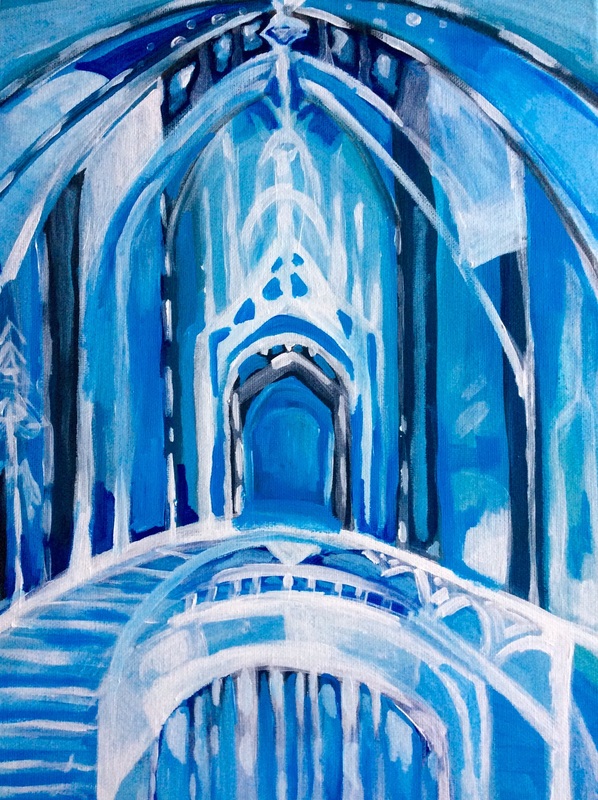 With bone chilling winds blustering outside, what better time to share my latest Frozen-inspired piece? This winter, when I was feeling particularly tired post-Christmas, I was looking for a simple, quick project to keep my hands busy as I recovered from the holidays and put more serious thought into what my next piece would be. 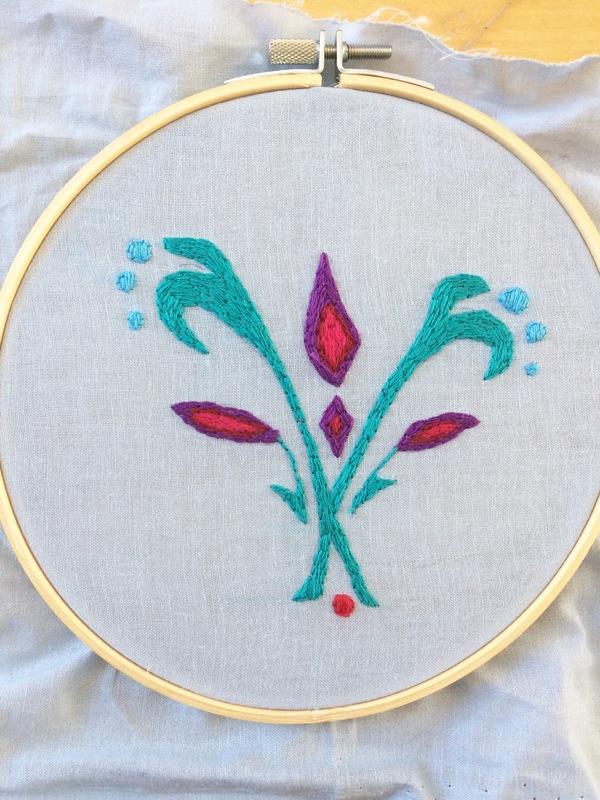 Thinking about textiles and re-representing them in textile art, I decided to do an embroidery piece based on Elsa’s coronation dress from Disney’s Frozen (because, let’s face it, we all know I love that movie and it is great inspiration for winter). The design and color palette of her dress is simple, refined and very-much Scandinavian, and the design found on the bodice embodies those traits. I wanted my simple embroidery piece to be much the same. 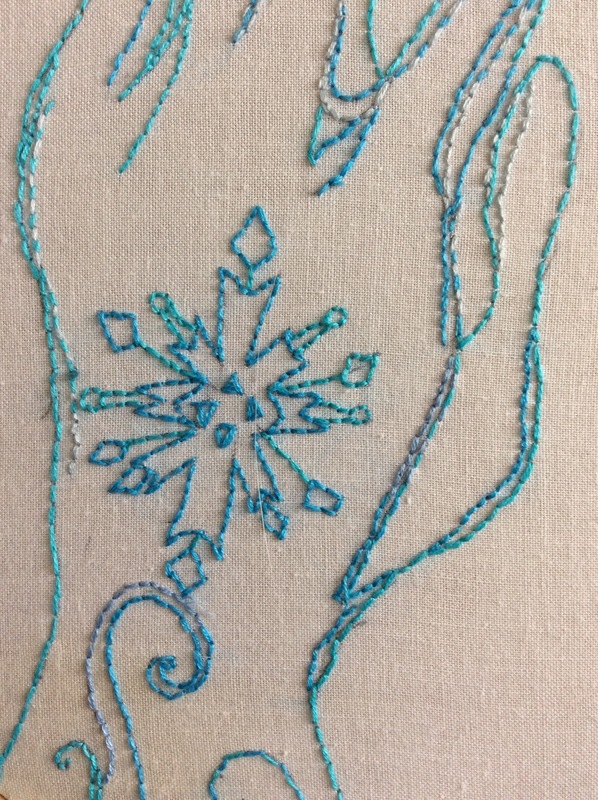 When starting this embroidery, I didn’t have any fabric on hand that was the same color as Elsa’s dress. No matter! I wanted to make the piece mine after all. Instead of using the dark turquoise color, I landed on a light blue before free-hand drawing the design on with a ballpoint pen. After that, it was a matter of filling the piece in with corresponding colors. Feminine with allusions to both winter and spring, I’m hoping this is the last cold-weather inspired artwork that I will be sharing for a while! Today marks the first official day of winter, also known as Winter Solstice. This year in Central New York, it’s looking like we may actually, finally get a white Christmas! While the Christmases of my childhood were always white, the last few years have left us New Yorkers in a green-spell, dooming us with rain and warm weather on Christmas day. Sending out some white-Christmas vibes, I’m sharing with you a recent colored pencil drawing of mine, inspired by Disney Frozen protagonist Elsa, the Snow Queen. It’s no secret that I love Frozen and have mentioned before my fascination with winter-themed magic. This drawing was fun to do from the fan art perspective as the imagery was not taken directly from the film. Rather, I modeled the drawing after a real-life image of an arm and added my own Frozen-inspired touches. Although New York doesn’t have its own personal winter sorceress to ensure we have snow this Christmas, I’m hoping the wishes and prayers of its residents is enough to allow this holiday to live up to its fullest and most magically picturesque potential! P.S. Only 3 days until Christmas! Most of us can remember making snowflakes when we were children, frantically cutting geometric shapes out of pieces of paper and hanging them throughout our childhood homes. 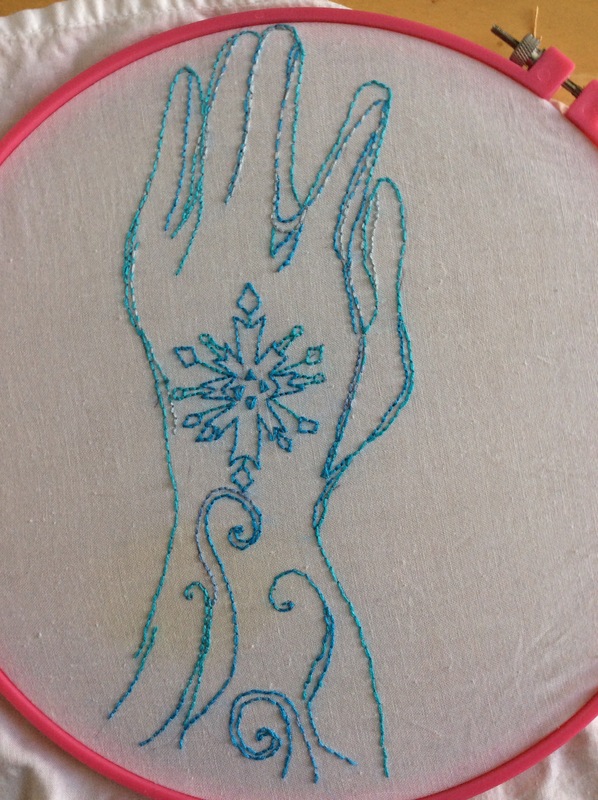 Still entranced by snowflakes as an adult, I decided to bring snowflake art to the next level, completing this freestyle hand embroidery inspired by the movie Frozen. This piece, while differing greatly from my usual subject matter with its focus on pattern, was very relaxing to work on. After drawing the outline in pen, I then worked very methodically: filling in one piece at a time, following with the corresponding sections in the other five points. As of late, I’ve been using my embroidery pieces to capture the idea of every day magic. Objects or occurrences that occur in nature (or perhaps they’re believable enough that they just might) that possess a fantastical or magical quality. I was inspired by the Frozen snowflake in particular, as it is used as a symbol of Elsa’s powers and magical abilities. The snowflake’s design represents the power of strong colors and geometric shapes, and their ability to transform something created by nature into something otherworldly and beautiful. Greatly pleased with the outcome, I plan on framing this piece and hanging it with the rest of my holiday decor this Christmas season. Continuing on with summer reading, today’s post is all about nonfiction. While a lot of people shy away from this category, thinking it to be dull or uninteresting, I absolutely adore nonfiction. It’s broad. Nonfiction could mean anything from how-to books to biographies. It can teach you. Whether you are educating yourself on a particular topic or teaching yourself a new skill, I love reading for a purpose. You don’t have to read the whole book. A lot of times, a nonfiction book can serve a purpose in a matter of pages or chapters. You don’t necessarily have to read it cover to cover. If you have any interest at all in interior design or decorating, then you absolutely must check out this book. Will Taylor’s sense of style is quirky and unique, while also managing to make complete sense. Having worked at a public library for the past six years, I have seen a lot of home decorating books. This one is my favorite by far. This cookbook is a lot of fun and has encouraged me to try cooking traditional British cuisine. Whether you are an amateur cook or an expert chef, this book provides recipes for a wide range of skill sets, supplying Harry Potter quotes as it does so! So far I have tried the cauldron cakes and Kreacher’s French Onion Soup, and both of which were delicious! I was actually required to read this book for my “Social Media Theory and Practice” course. Despite the fact that it was assigned, I truly enjoyed it! One of those books that will make you think differently about our world and digital landscape, I highly recommend this book to those who have an interest in the internet and the effect it has had on mankind. I have mentioned this book before, as I love the artwork and the behind-the-scenes look at the animated movie that broke records and won acclaimed awards. I loved reading about the research that went into designing the characters, costumes and architecture present in this Norwegian-inspired movie. If you’re an adult that loves Frozen like I do, then you will love this book. Aside from buying me a new dresser (which I needed desperately) Andy also bought me these two amazing #books: "The Art of #Disney #Frozen" and "Harry Potter: Magical Places from the Films"
I discovered this book when working on a PR management project. As a PR major, I wanted to learn more about the most successful communications business man in American history. Aside from supplying great leadership advice, the author is also successful in providing useful personal insight. This book will leave you feeling inspired. If you haven’t already done so, be sure to check out my top picks for novels and series! Happy reading! I tried to resist…but I couldn’t! For those of you who have eagerly been awaiting the arrival of Epcot’s Frozen Ever After, you can check out the inside-the-ride video here! And if you just love Frozen, check out this embroidery, this painting and this drawing! Defining Fibernation: The act partaken by select mammals in which such individuals spend the winter months creating fiber art and/or crafts. All these and more are great ways to utilize fibrous materials for crafting and, as I prefer, creating art! It’s awesome, fun and relaxing. It is space-efficient (aka: fold-able and easily stored). So although I have not yet blogged about any of my fiber obsessions, I plan on sharing a lot on this subject in the near future. Winter weather causes me to hibernate, or fibernate if you will. To start off this series of posts, I am sharing two of my most recent embroideries. Both pieces were done using hand embroidery and what I consider to be a drawn style. 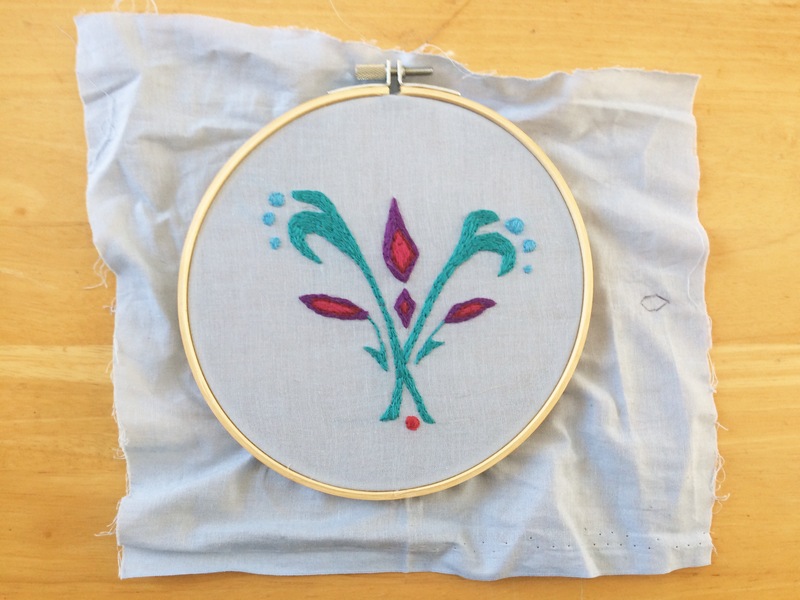 While most of my embroidery pieces mimic paintings, these look more like drawings. This is a style that I had recently decided to try out. 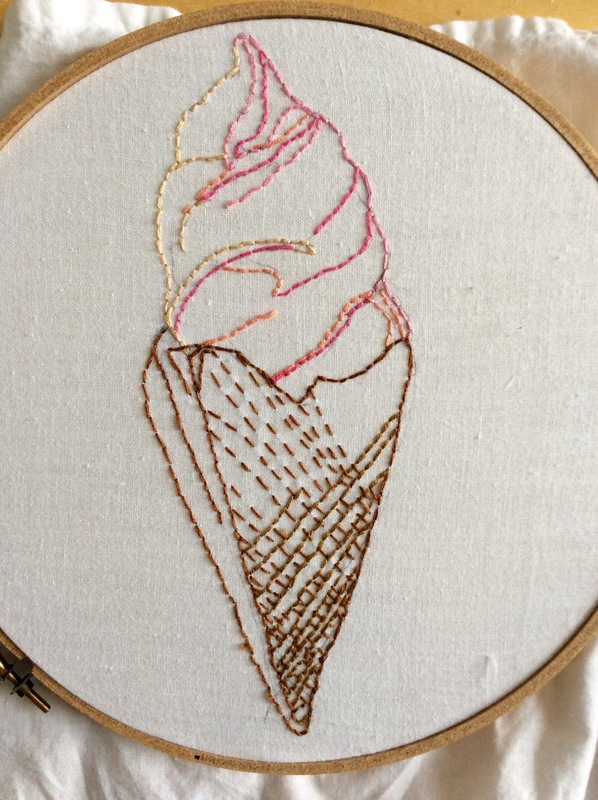 The first one was completed this summer and is (obviously) an ice cream cone. I had a lot of pink embroidery floss and had been looking for a way to use some up. 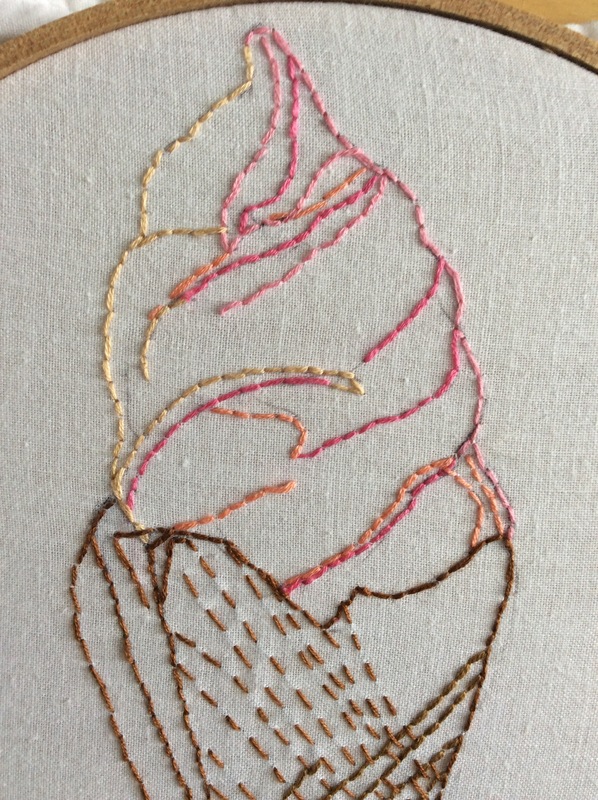 Both the ice cream stitches and the cone stitches utilize the back stitching technique, however the running stitch can also be found in the cone. 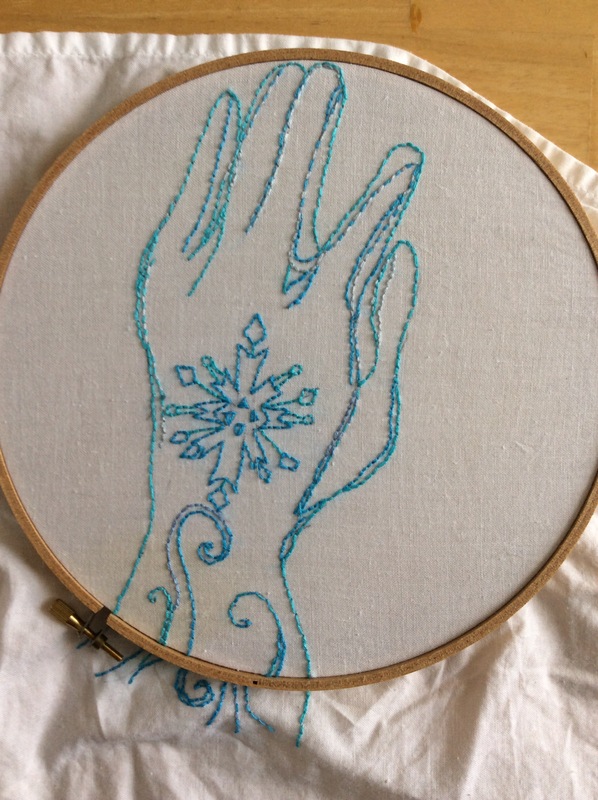 The second was completed this month and features Elsa’s glove from “Frozen” (I know, I’m sorry it’s another “Frozen” inspired piece but the imagery is just so inspirational!). In the movie there is a lot of symbolism that surrounds characters and their gloves. I thought it would be fun to represent this important article of clothing in a cloth medium. Both pieces began as old cloth napkins (another reason why fiber art is awesome is that it lends itself to recycling). After drawing inspiration and shape from different images, I sketched the outlines lightly in pen. After that, it was just a matter of going over the outlines with 3-ply embroidery floss. This is great for when you are watching movies on a cold winter night. Hopefully this post has at least created some interest in the world of fiber art and, if not, I still have many planned posts ahead! Whether you are crafty or artistic, fiber is a medium that I would definitely recommend. Although I firmly believe that Christmas is not about gifts, I will say that I do love giving gifts to other people. It is not only fun, but allows you to show the people in your life that you care about them and have been thinking of them and their happiness. 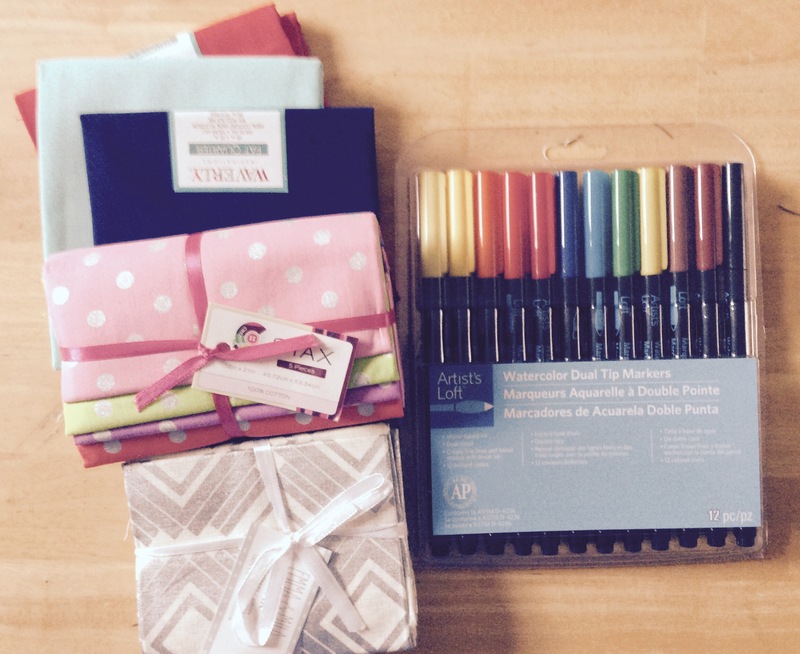 I think most of us would also sheepishly admit that receiving gifts can be fun. I was especially excited this Christmas because I received a lot of thoughtful gifts from multiple people that have provided me with new inspiration. That being said, I am writing this post as a thank you to my family members who took the time to think of me and provide me with new inspiration. 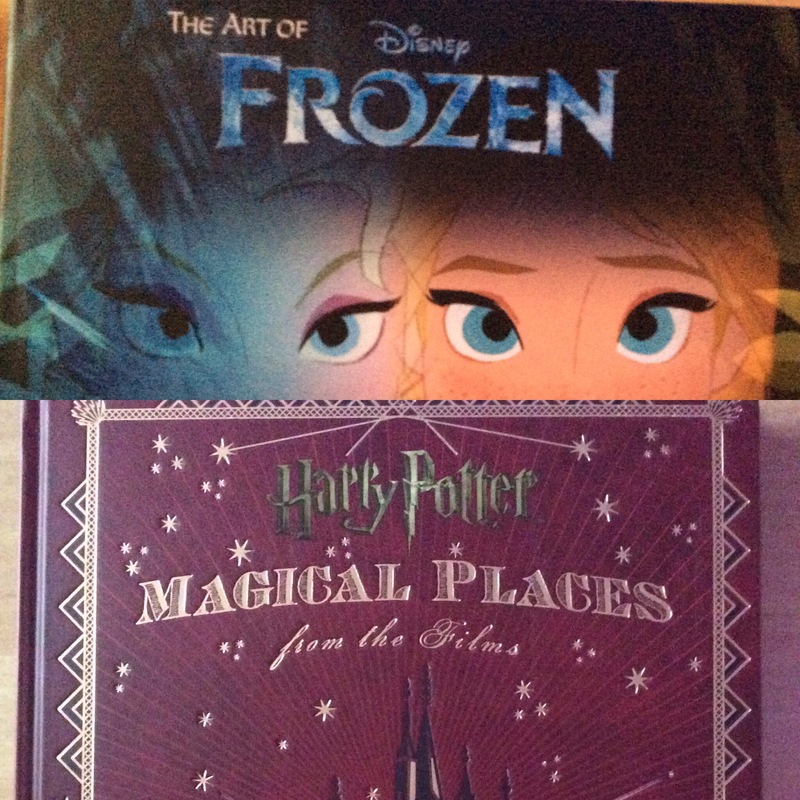 1.Books from Andy: Both of these books “The Art of Disney Frozen” and “Harry Potter: Magical Places from the Films” were on the top of my wish list. They are both beautifully illustrated production books that are full of awesome behind-the-scene information and artwork to two of my favorite franchises. 2. Canvases and Sketchbook from Grammie: These are both essential items to artists and painters, but items that I don’t always like spending money on. Therefore I was very excited about having some new blank slates for creating over break. 4. 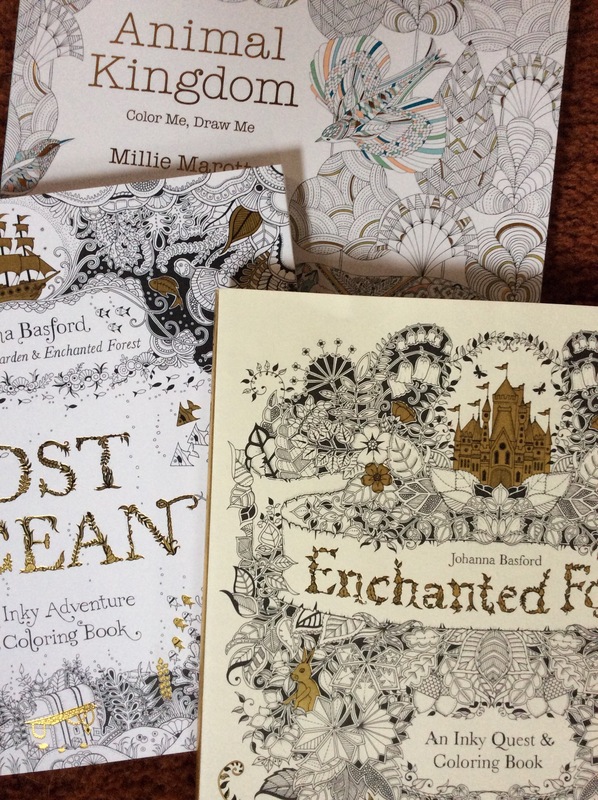 Coloring Books from Matt: As I have mentioned before, coloring is awesome. I’m so excited that my brother has gifted me with enough coloring books to last a lifetime (or at least, until next Christmas). 5. Nutcrackers from Dad and Sandy: After reading one of my recent posts and learning that I collect nutcrackers, my father’s wife Sandy went out of her way to find some awesome nutcrackers for my collection. 6. 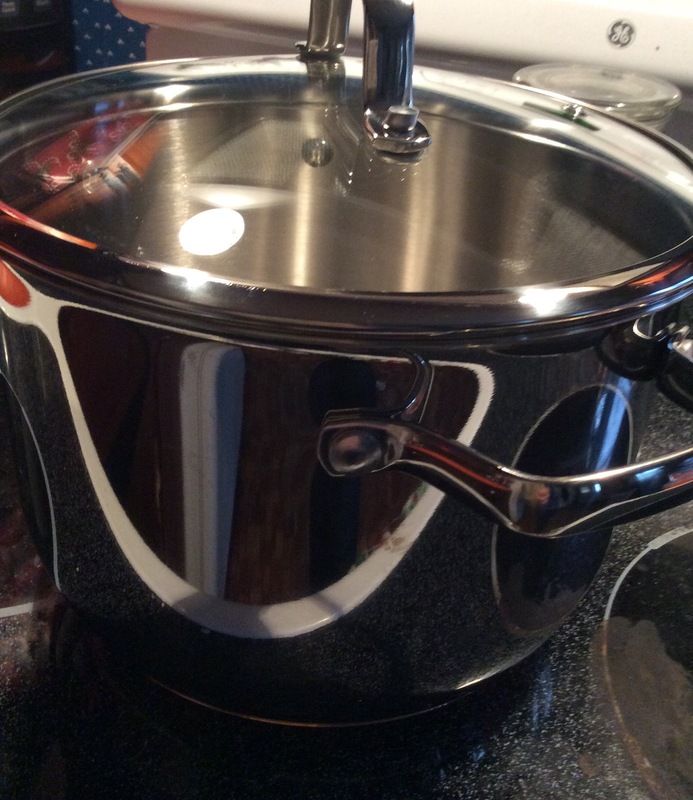 Pots and Pans from Andy’s family: Despite the fact that I cook multiple times a day, I did not own quality pots and pans prior to this Christmas. This was a wonderfully useful surprise. 7. Game of Thrones Calendar from Andy’s Brother and Sister-in-Law: I love “Game of Thrones,” books and quotes. So this daily calendar will provide insta-daily-inspiration. Thank you so much to all of these people and many more! I am greatly inspired and look forward to creating diligently during the remainder of my winter break! It has been much too long since I have been in a painting studio. In undergrad, I was extremely fortunate to be an art major who was privy to newly-renovated studios. As a painting specialization, I spent a particularly large amount of time in this studio creating with oil paint. Currently without a studio, I am confined to acrylics and watercolor, presently afraid to use oils within my house. Although I plan on having a studio in the future, I am currently grateful for any chance that I get to enjoy painting. As an art student, I was always encouraged to produce conceptual work. However, getting a masters in public relations from the Newhouse school is a stressful experience.Therefore, lately, I have been enjoying painting for the sake of painting. 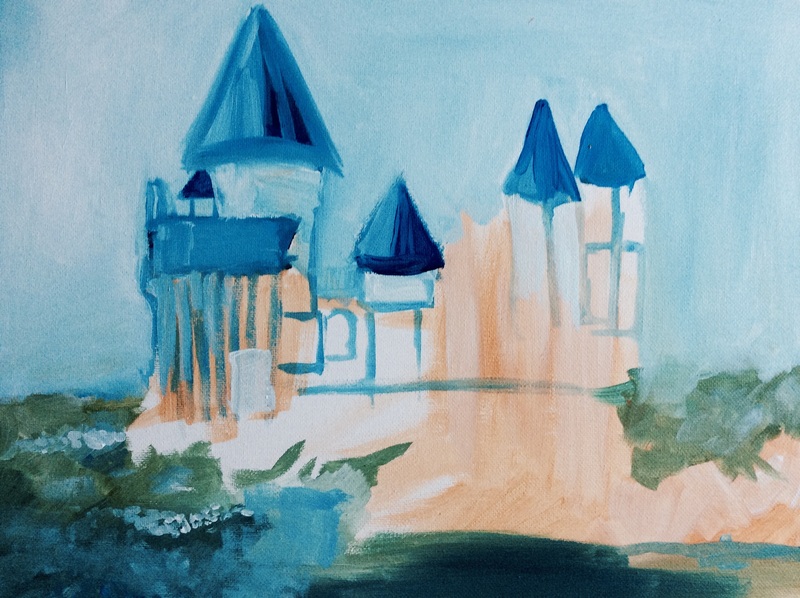 To start this new, once-forbidden period of my artistic life I have decided to do a series of acrylic on canvas paintings featuring castles from pop-culture. The first castle that I recently completed was Elsa’s ice castle from Frozen. I decided to start with this castle for a few reasons. The first being my recent inspiration from the movie (mentioned in a previous post) and the second being the limited color palette. I knew this painting would go quickly for me and therefore chose to do it now as I have been especially busy with midterms having just recently passed. The next castle on my list is the fictional castle that has had the greatest impact on me and my life: Hogwarts. I obviously have a long way to go on this painting, but don’t mind sharing this very early-stage snap shot as I love looking back and seeing how far a piece has come. The bottom line is that you must make the piece your own, in some way or another. Both of these paintings are legally OK as they are in new media. I have taken an animated castle and reproduced it in paint. I have also added my own designs. In regards to Hogwarts, which obviously has a long way to go, I will make it my own through color choice and the fact that it is being created with paint. So as I have mentioned before, don’t be afraid to be inspired by the world of pop-culture. It is popular for a reason! Just be sure to make things your own. We are all creators after all.